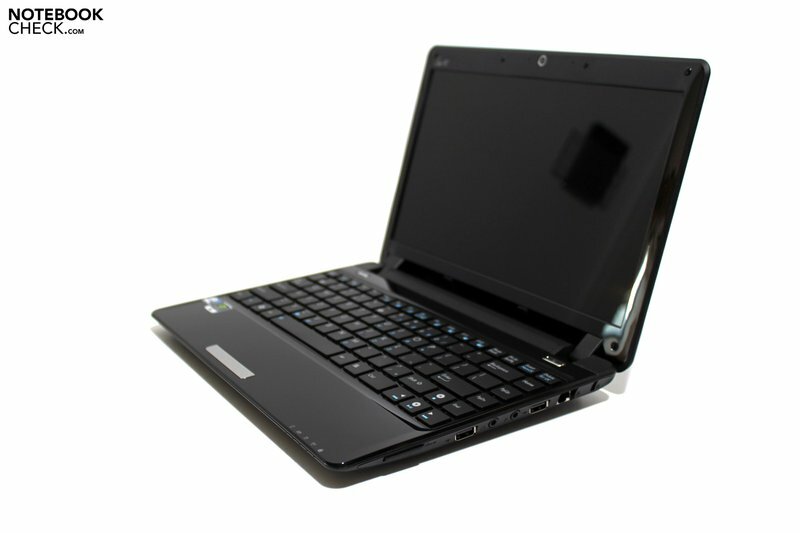 As far as netbooks are concerned, Asus has always taken pride in its pioneer role in the various fields. Asus has, however, surprisingly allowed itself plenty of time as to the topic of Ion, so a powerful GeForce 9400M graphic card combined with an Intel Atom CPU, as there are already comparable competitor models on the market. But Asus wouldn't be Asus if there wasn't the one or other feature slumbering in the case. We usually list the various model alternatives that are available on the European and American markets here. 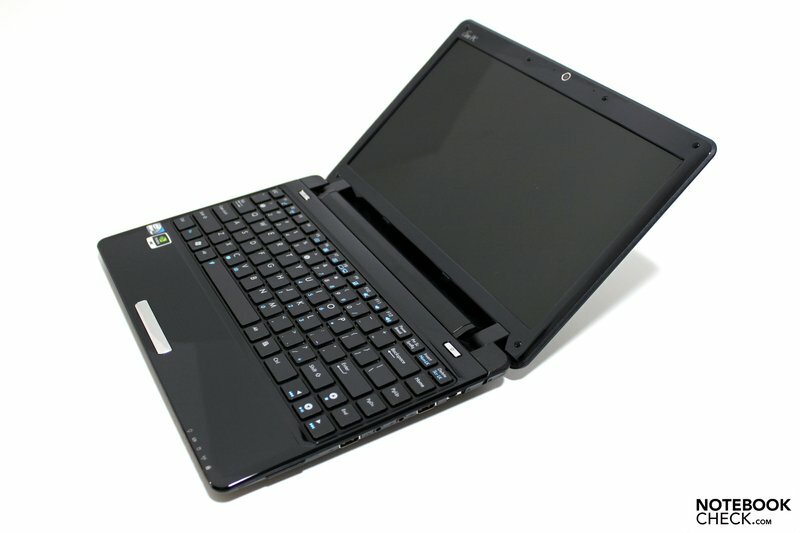 At the moment, we can only refer to our prototype in the case of the Eee PC1201N. Amazon.de already lists a model at a price of 499 euro. Asus indicates the first or second week of 2010 as the presumed launch date. Our prototype is the almost final version with a UK keyboard. It's an innovation for Asus' netbook range that Ion is built into the Eee1201N but otherwise it's nothing really spectacular. First the employed CPU provides reason for a new "We are first!" anniversary. That is, an Intel Atom 330 chip with a clock rate of 1.6 GHz - and here it comes - two physical cores are used. You'll find the details about it in the following review, especially in the performance part. Asus reveals the case size with the label 1201N, thus 12 inches. The prior border between netbooks and subnotebooks has once again been overstepped. The user will be rather delighted about this fact, as he not only comes to enjoy a display with a much better overview but not least also because of the larger resolution of 1366 x 768 pixels and a more generous, almost fully functional, keyboard. You could oppose this with a case that is a few centimeters larger and a weight of a few hundred grams more in comparison to its 10 inch colleagues. But the Eee 1201N presents itself as still very mobile with a total weight of 1450 grams and still fits into an average ladies handbag. 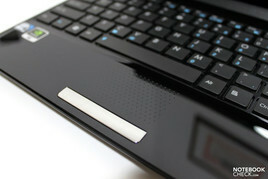 Asus has now obviously found its line in view of design. Asus has given the name "Seashell" to the wedge-shaped tapered case with the softly rounded forms on the outer sides. 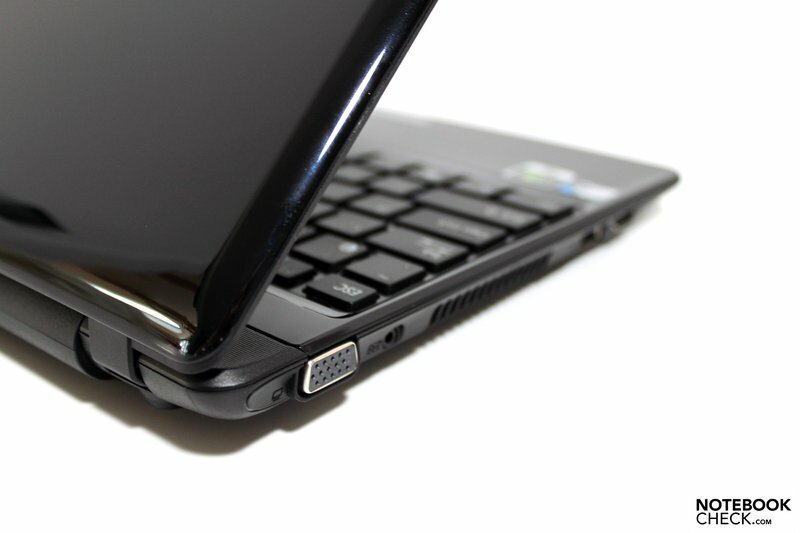 Various trimmings and inlays have been omitted and the netbook has been almost completely dipped into high-gloss instead. The only exception is made by the case tray, which has been made in a classic matt structured look. As already so often, we have to note that glossy surfaces have an extreme tendency of soiling by dust particles and fingerprints. Opening the display lid without leaving any marks on the display lid is almost impossible. Additionally, fine scratch marks, as they frequently occur at packing and unpacking, can quickly blemish the notebook if you're not careful enough in this regard. Perhaps one more note about the color. Our prototype came along completely in black. Merely the chromed touchpad key and two keys above the keyboard (system on/off, touchpad on/off) were the exception here. However, looking closer at the prototype's carton, we found further printed color options for reasons of identifying the single packaged notebook. Conclusively, there might also be a blue, silver and red alternative of the Asus 1201N. 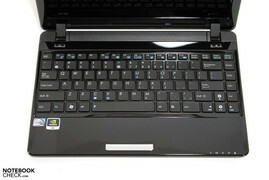 The Eee PC 1201N shows a very good stability aside from the lacquered plastic components' average material impression. The base unit can barely be twisted and doesn't show any irregularities even under selective pressure. Even the display bids a good stability in every possible way considering its slim construction. 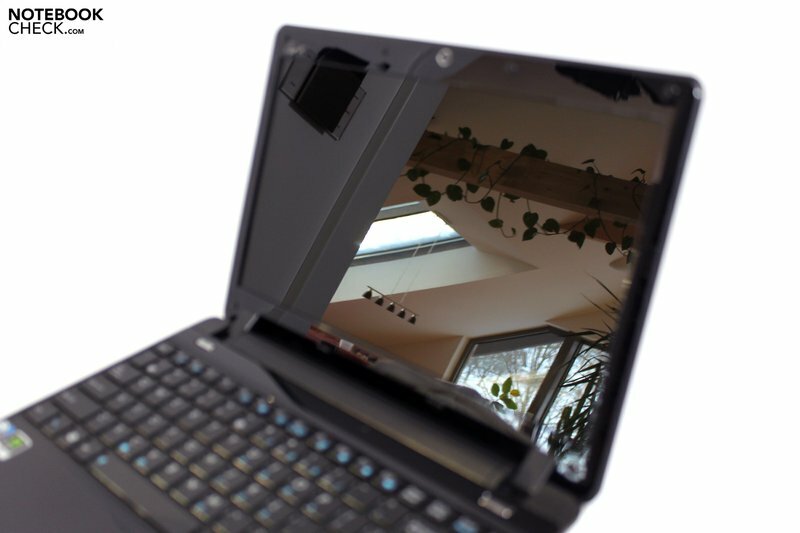 Picking up and carrying the netbook on its display bezel is also possible without further ado. Both display hinges seem to have a sufficient size and allow a precise opening angle adjustment but could do with a bit more tension in, especially, a closed state. The display opens a few centimeters when the closed book is held upside down. 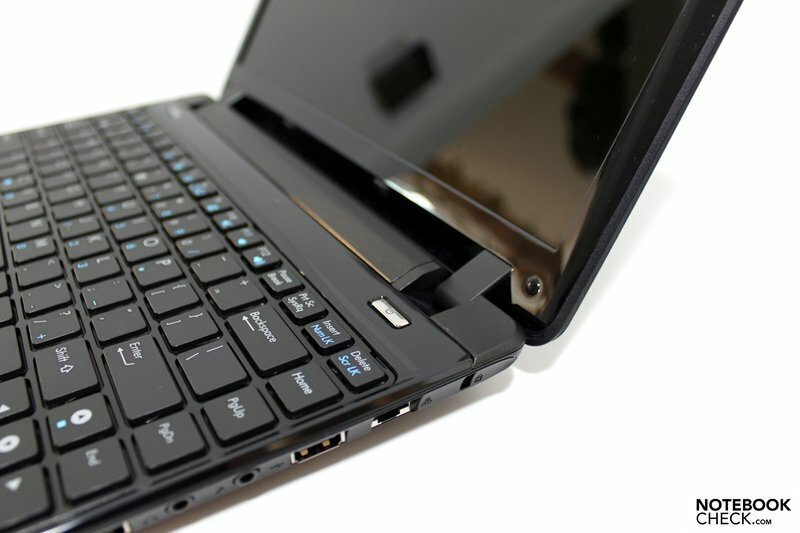 Therefore, especially for a mobile netbook, you have to make sure that no foreign objects can slip between the display and base unit when it's stowed in various cases and so cause serious damage. 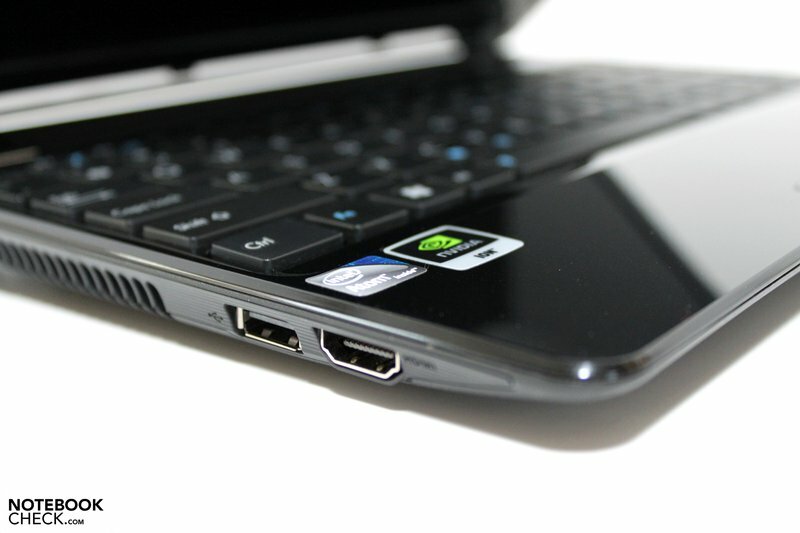 The netbook's design excludes the front and rear as a place for interfaces. But Asus has tried to place, specifically the often and permanently occupied ports rather more in the lateral edges' rear area. This, for instance, has been achieved with the VGA port, the DC-in and the RJ45 LAN port on the right. However, VGA port and DC-in have been placed very close to one another, which could lead to problems with an external monitor or a projector. 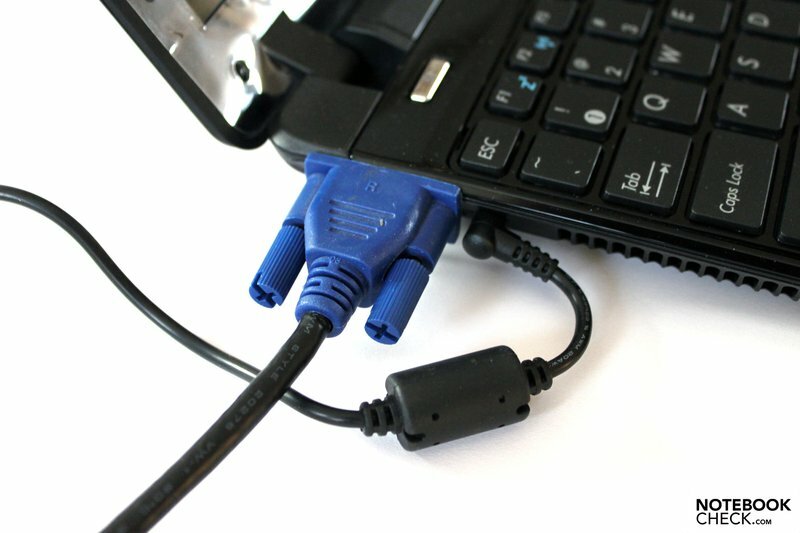 Above that, the little plug of the adapter easily slips out of the socket so that an unintentional disconnecting from the mains can't be excluded (that is if you oversee the optical feedback at disconnection on the display). Otherwise, you'll also find the netbook typical three USB ports distributed on the left and right side edges and, thanks to Ion, the HDMI port on the case's left, but not quite optimal in the front area. Thus, the user now has two interfaces for connecting external image display devices available. The analog VGA port is, for example, supported by many older projectors, and practically every monitor is still compatible in this regard. You also have the option of sending a digital signal to appropriately equipped monitors with the HDMI port. Our test will show what it's good for. Whilst only an averagely focused image is transmitted via VGA to our test monitor (Dell 2408 Wfp) in a resolution of 1920 x 1200 pixels, HDMI does it considerably better. The image on the external monitor is crystal clear, focused and is suitable for permanent work use. Perfect, if you'd like to extend the Eee 1201N by a big, ergonomic display, for example, for using it on the desk at home. Because there aren't any details about the Eee 1201N available, we can only refer to the modules built into our prototype in terms of communication configuration. For instance, an Ethernet module from Atheros (AR8132 Fast Ethernet 10/100) had been used. In view of wireless communication, a Realtek RTL8191SE module (802.11b/g/n) provided for the according connection. Information about integrated mobile broadband internet aren't yet available. At least an appropriate preparation (SIM slot) couldn't be found on the case, yet. Amazon.de also lists Bluetooth as a configuration option of the pre-orderable netbook. 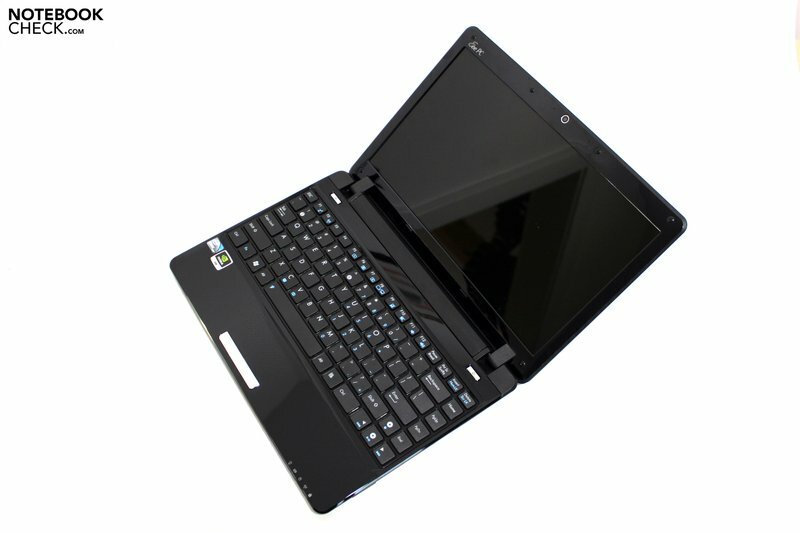 It's also still a bit unclear if, or even which supplies will be included with the Eee PC 1201N. We found software for rendering various audio and video files with "Total Media Theater 3" on our prototype. Even Microsoft Works bustled around on the desktop. As in most other Eee siblings, you also have the benefit of Eee WebStorage in the Asus 1201N. 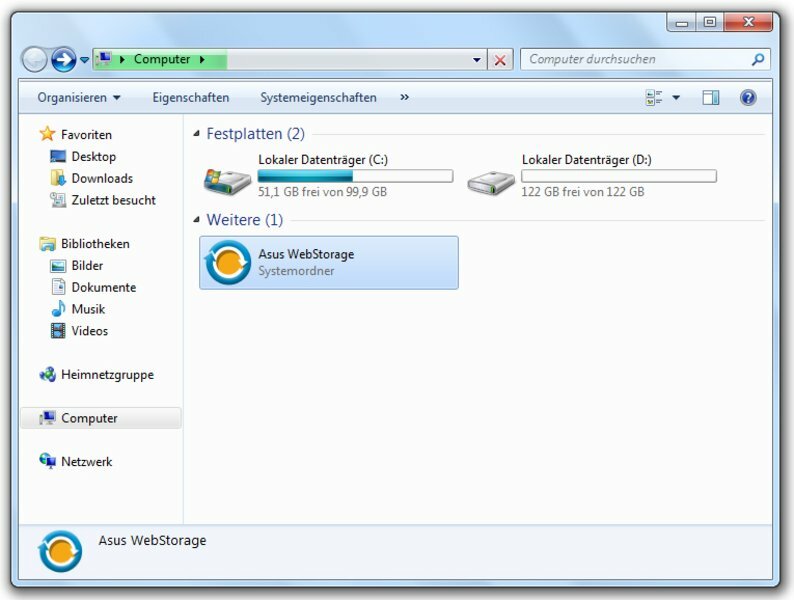 This is a memory space on a server, which you can access from everywhere, that is if there's an internet connection. In our opinion, the basically good idea has a catch, though: Data exchange with the online server requires both an appropriate efficiency at downloading data as well as, naturally, uploading it. But, unfortunately, you still find substantial bottlenecks in many internet offers just exactly here. An upload of about one GB at, according to the provider, a maximum rate of 512 kb/s can sometimes take up almost half a day. 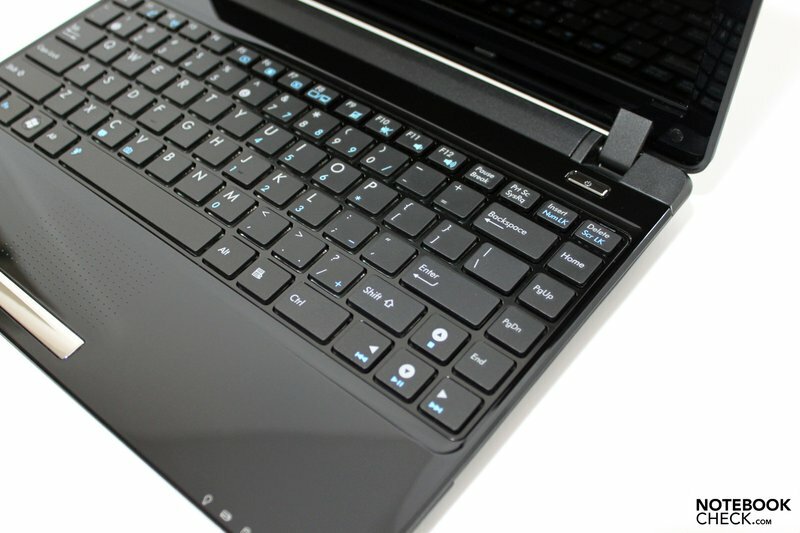 As already mentioned in the beginning, especially the keyboard benefits from the Eee PC's size gain. The given key field comes close, for example, to the one built into the office classic Thinkpad T61 (285 millimeters) with a width of 280 millimeters. The single keys, in chiclet design, turn out quite small in view of their stroke surface of 14x14 millimeters. But together with the gaps between the keys, an easy and accurate input is possible, anyway. Judging the keyboard layout is a bit difficult because our prototype is a sample with a UK key layout. But despite the characteristics related to that in terms of the single-rowed return key and the y-z keys, the layout appealed to us. Many users will benefit from "Delete" on the right upper edge and "Control" at the keyboard's other end. 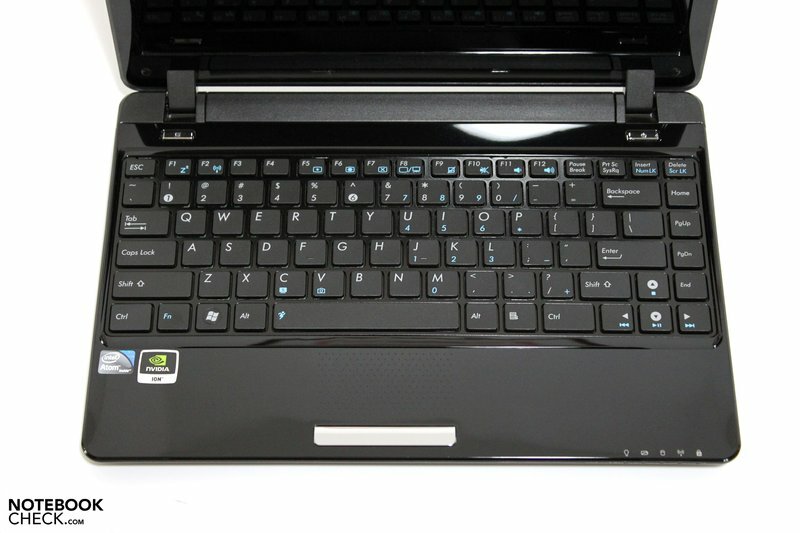 Apart from a key for disabling the touchpad, the Eee 1201N doesn't have any other hotkeys. Various functions (volume, display brightness, WLAN, ...) have to be controlled with assistance from the FN key and F keys. A few words to the given typing feel: The short stroke length with the very evident pressure point would be very comfortable. Unfortunately, the keyboard in our prototype had the strong tendency to yield in the left and right halves' center and even to clatter at a slightly more vigorous stroke. This can get very annoying in the long run. We could only prevent this on the netbook at hand by resolutely working with touch typing and a gentle stroke. 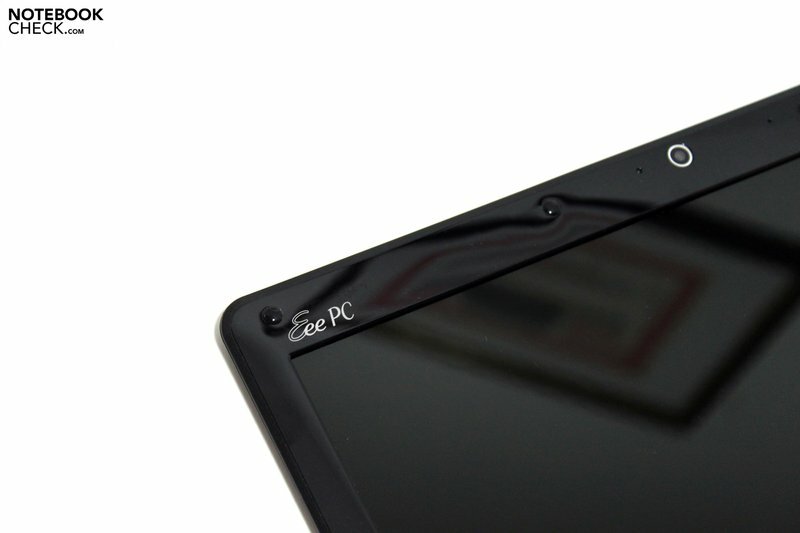 The well-known multi-gesture touchpad is even used in the new 12 inch alternative of the Eee PC. It's capable of a few extended gestures, such as zooming and scrolling by using two fingers. The mentioned function responded well in our prototype. As long as you are blessed with dry fingertips, you can navigate pleasantly on the lacquered touchpad surface covered with fine knobs. Moist fingers will rub unpleasantly over the pad and surfing turns quickly to suffering. 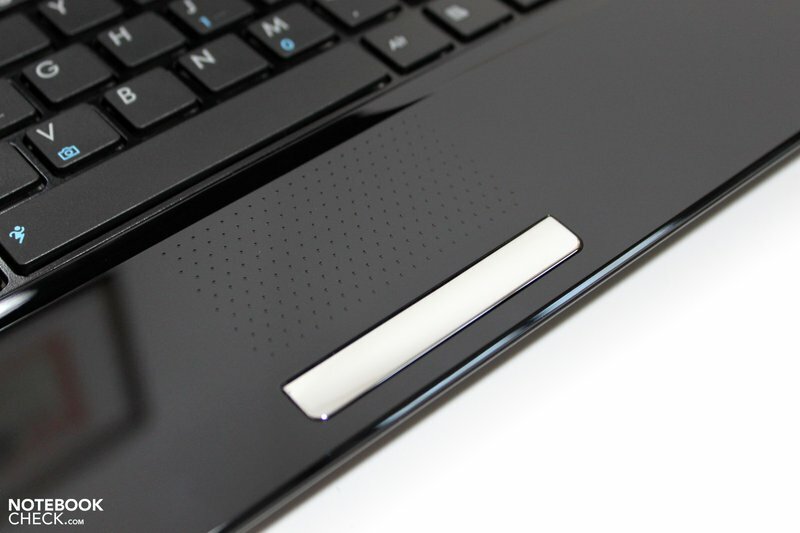 The feedback for the key bar underneath the pad also turned out ambivalent. The chrome bar soils quickly and intensely and only can be pressed agreeably on its edges. A dead zone in the center area, where inputs are either not at all accepted or only with especially strong pressure, is annoying. 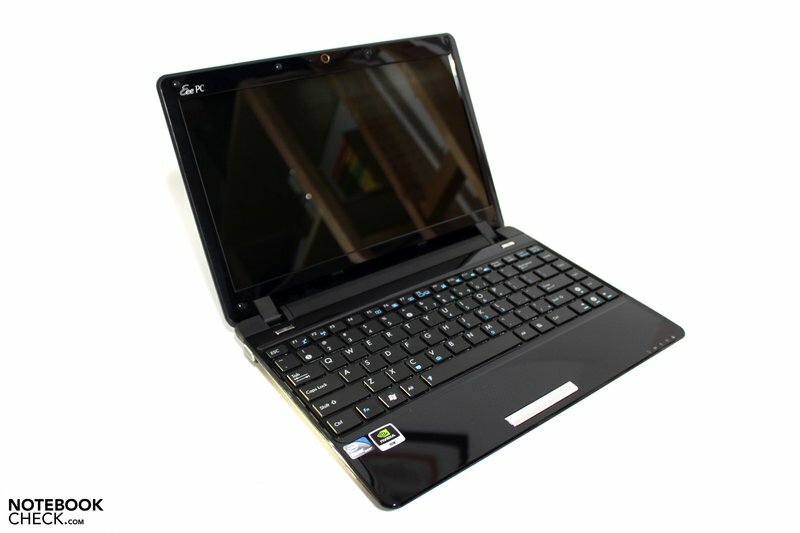 The 1201N belongs to the giants of the netbook category with a diagonal of 12.1 inches or respectively 30.7 centimeters. 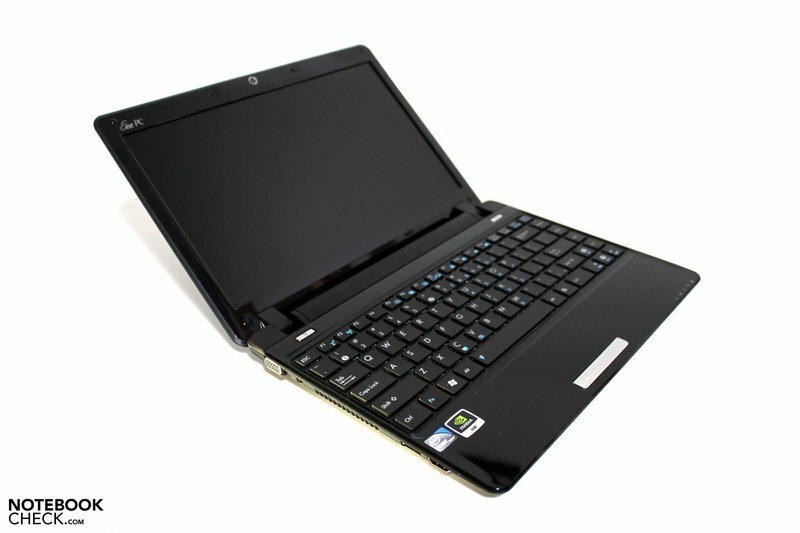 The compact netbook also has a resolution, as it's currently seen in many much larger 15 inch notebooks, of 1366x768 pixels due to an HD resolution. We can take any concerns that you may have about not seeing anything on the display right away. 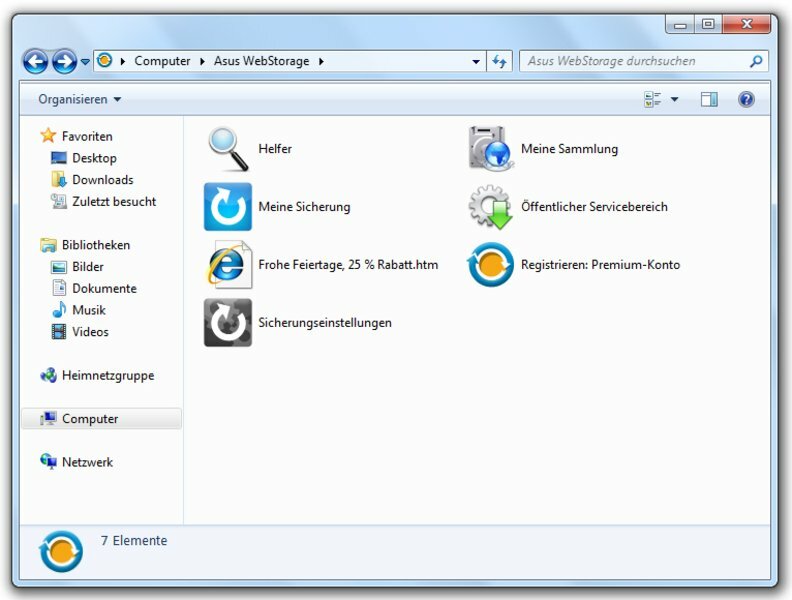 The displayed content (script, images, desktop symbols) can be individually adapted with the zoom function. We especially liked the display's clear arrangement, websites that are cut off on the right edge are practically never seen. But, so to say in the same breath, we also have to counter with a few cons. In particular, the reflective display surface has to be listed here, as so often, which annoys with reflections both indoors, as well as outdoors in adverse light conditions. 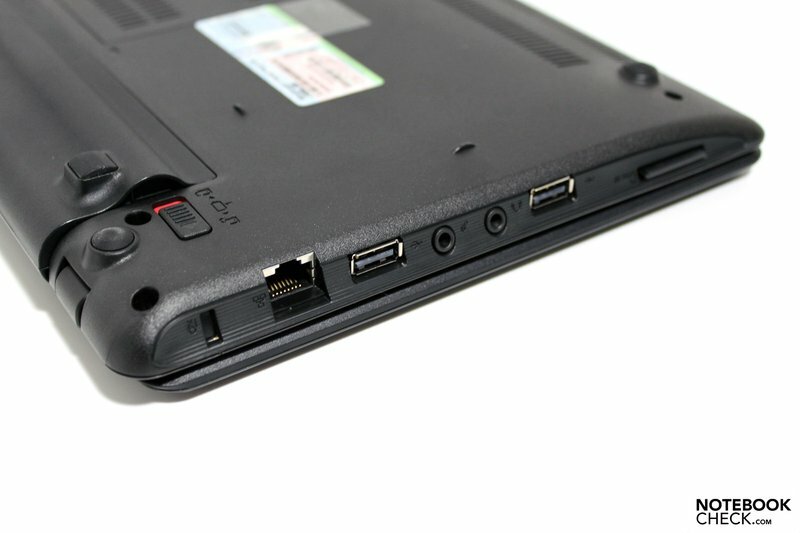 This minimizes the netbook's mobility quite a lot. The second point would be the assessed, comparably low display's brightness. The maximum is just only 111cd/m2 in the display's center area. This is enough for indoor use, but turns into a fatal combination for outdoor use together with the glare display. Naturally, the other assessed key data also only turn out average with this maximum in terms of display brightness. The illumination of 83.3% at least certify the screen a homogenous brightness distribution. The contrast of 222:1 is also okay. Subjectively, the given image doesn't really seem luminous. We caught ourselves trying to turn up the brightness indoors several times - no chance. Also, the popular tool Eeectl denied its duty in the 1201N. There's not much to add about outdoor suitability. The combination of low display brightness and reflective display surface speaks a clear language in a field experiment. Nor does it help much, if the maximum display brightness is also available in battery mode. The Eee 1201N doesn't reap any laurels with the given viewing angle stability. It very quickly comes to visible changes in the vertical viewing area; the image remains stable longer in the horizontal area but annoying reflections turn up quickly. The opening angle of 141° at least allows adjusting for almost every application. 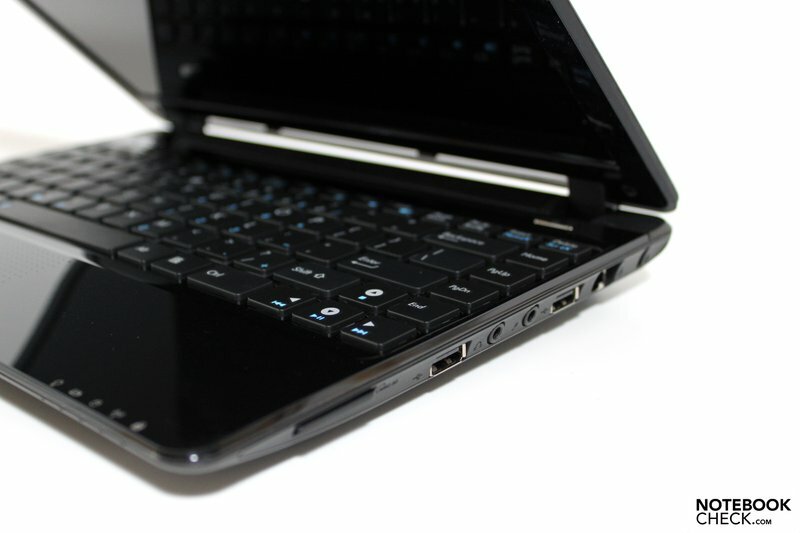 Now we come to an especially intriguing chapter of the Asus Eee PC 1201N - the performance part. The reason for our curiosity is, among other things, the combination of Intel's Atom dual-core CPU and Nvidia's 9400M graphic, aka ION. The Atom 330 is a nettop / desktop processor and the only Atom of the range with two physical cores. Until now this Atom CPU has only been available with Intel's desktop chip set and therefore has been virtually taboo for use in netbooks (because the power consumption was considerably higher). The combination of Nvidia's nForce 730i chip set has obviously lifted this barrier. The Atom 330 CPU has a Frontsidebus of 533 MHz, a 1 MB L2 cache, a clock rate of 1600 MHz and is manufactured in a 45 nanometer process. 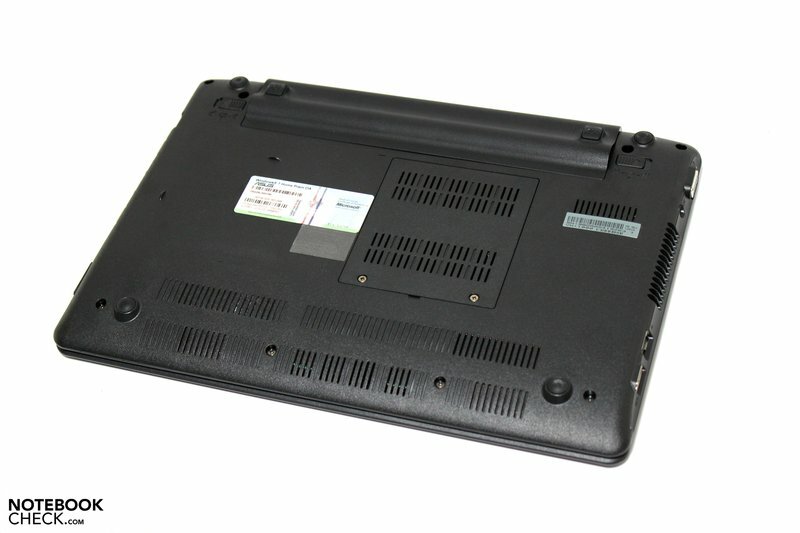 This chip has a 4x as high maximum power dissipation, with a thermal design power (TDP) of 8W, than the N270 or N280 chip frequently used in netbooks up till now. However, the chip supports 64 bit applications, which also distinguishes it from both other mentioned single-core competitors. The chip even simulates four cores due to supported hyper threading (simultaneous processing of 4 threads possible). The higher TDP already indicates a higher power consumption of the chip. 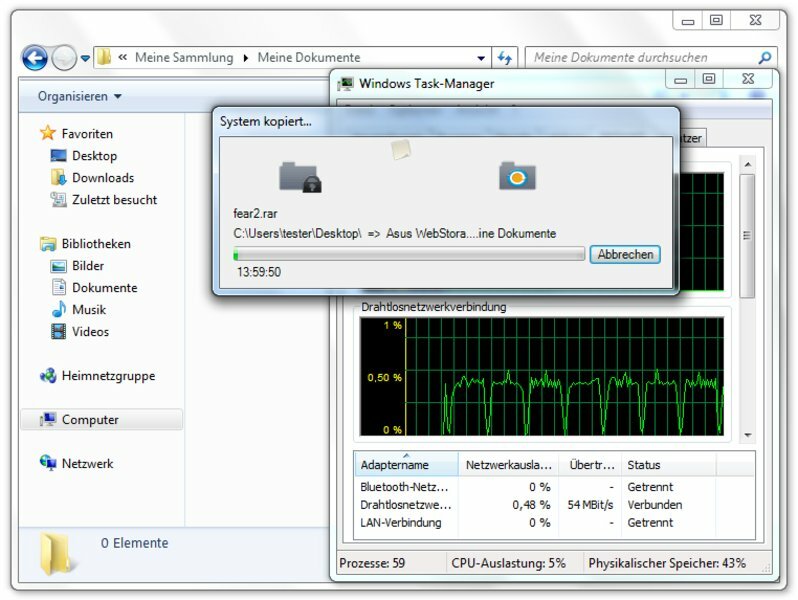 A further difficulty is that the CPU doesn't support Speedstep and therefore runs with the full 1.6 GHz even in energy savings mode. Its mobile colleagues can do that a lot better (N270 – C1, C2, C4 States; Deeper sleep, Enhanced Speedstep). If you compare the SuperPi benchmark results (single thread performance), the excitement in view of CPU is kept within a limit. 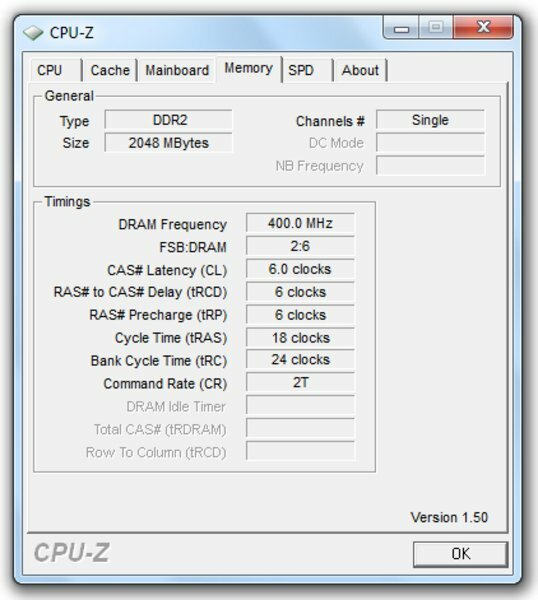 The observed results turned out a bit better than the average rates of N270 CPUs, but the N280 single-corer with a somewhat faster clock rate of 1.66 GHz stays in the lead in comparison. The result looks the same in the Cinebench rendering test. The compared chips were very close in the single-core test. The Atom 330 chip can use its whole strength first in the multi-core rendering test. It can almost double the result of its one-core colleague with 1516 points. This observation also reflects our impression when working with the netbook. A subjective performance gain in comparison to other netbook systems wasn't noticed, but the dual-core architecture allows multitasking use, as it's usually not or only possible with very extended waiting times in other netbooks. Thus it was very possible to continue working, to surf in the internet and watch Youtube videos within a reasonable speed adjacent to a CPU benchmark (SuperPi). 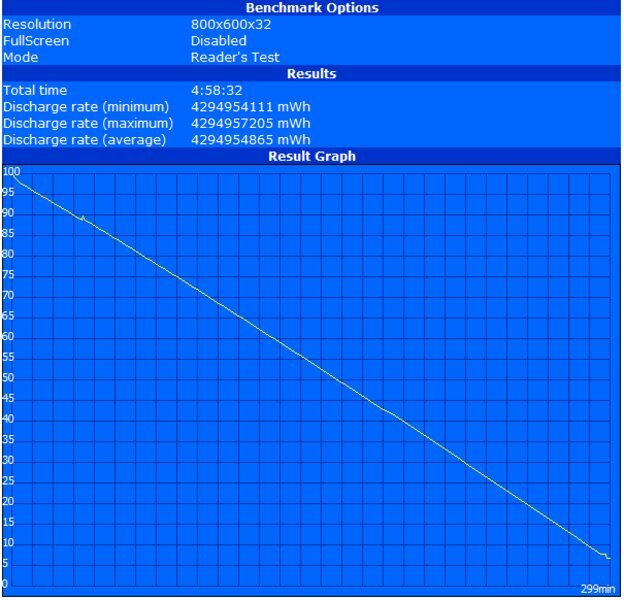 Because the PCMark 2005 benchmark test, unfortunately, didn't supply any results, there is only the PCMark Vantage benchmark test left for the performance comparison of application efficiency. Whilst the total result stayed very far behind that of single ULV notebooks, ground could be regained especially in graphic-biased applications (Gaming Suite). 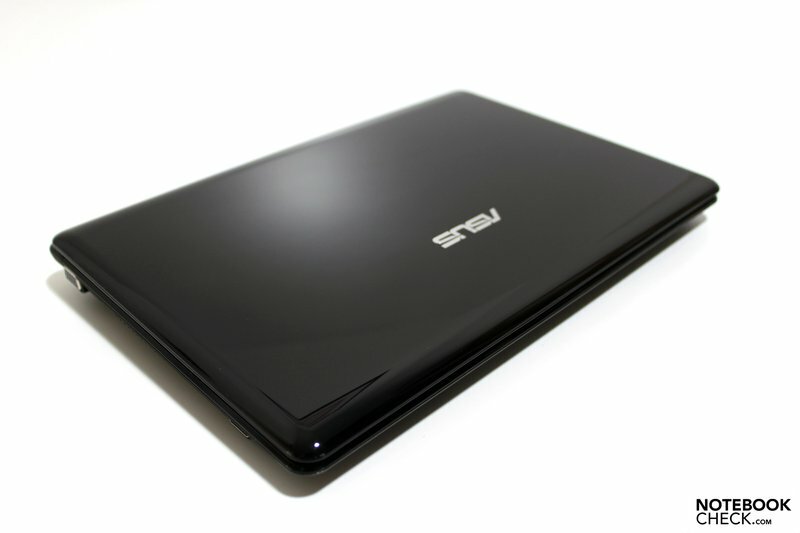 Devices with a stronger CPU and an Intel GMA 4500M HD don't have any advantages to the Asus 1201N. This also brings us to the integrated graphic solution, the Geforce 9400M G from Nvidia, also known as "Ion" in combination with the Atom CPU. 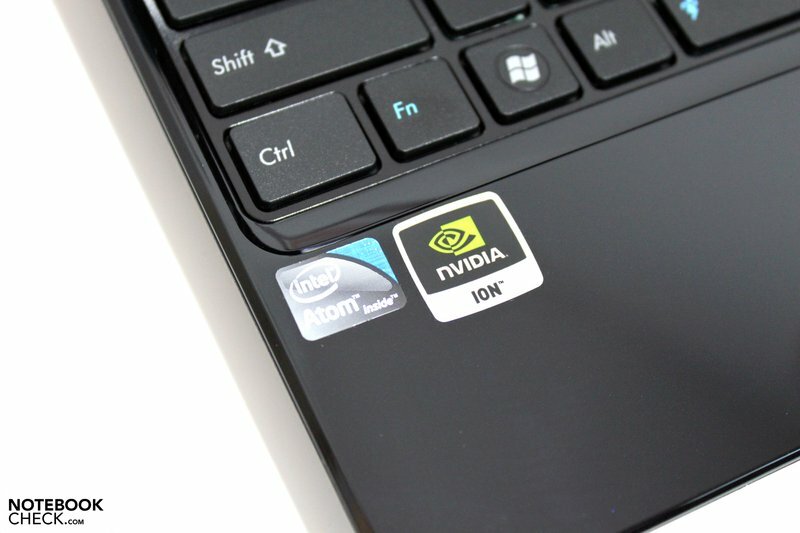 The Asus 1201N isn't based, as it's usual for netbooks, on an Intel chip set, but on the nForce 730i chip set from Nvidia. 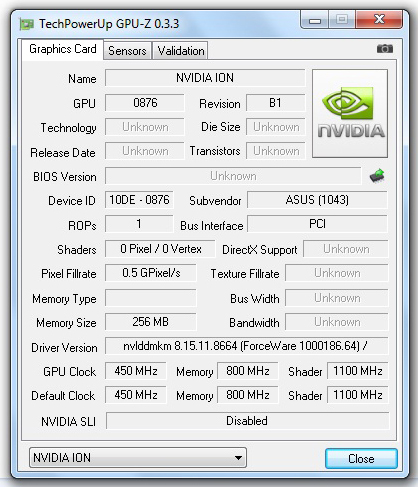 The graphic chip's performance itself would settle on about the level of a Geforce 9300M, an ATI HD 3450 or the already somewhat older multimedia starter graphic card, 8400M GT, in combination with an efficient CPU. These rates can't, of course, be reached with support from the Atom CPU, this was already shown in the gaming performance in the PCMark Vantage test, on about the same level as systems with an integrated Intel GMA 4500M HD graphics. 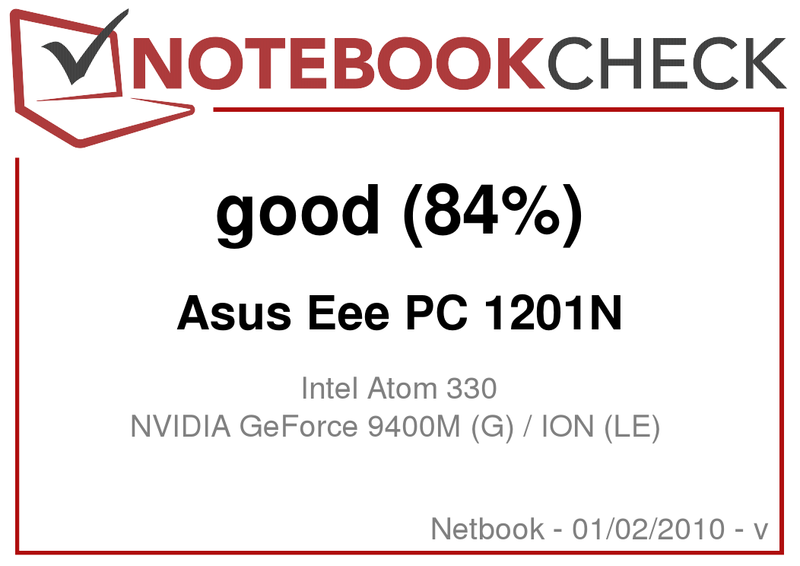 Even if that doesn't sound like much, it is a considerable leap in comparison to commonly equipped netbooks with an Atom CPU and an Intel GMA 950 graphic. This can be impressively seen in, for example, the 3DMark benchmark comparison. A monitoring of latencies with support from the DPC Latency Checker tool showed repeated outliers to over 2000 microseconds. This could lead to synchronization problems when external devices, such as external sound cards, are connected. The reason is often found in not optimized drivers. The traditional user doesn't have much from a theoretical gain in gaming suitability. However the 9400M G is capable to support the CPU in many real applications scenes, which doesn't hurt the weak Atom CPU. The GPU can, for instance, take over video coding tasks (HD videos) due to PureVideo HD. Because the chip can be programmed to use CUDA, the chip turns itself on, for example, in Photoshop (CS4) and influences single operations positively there. Even if opinions vary here and there, Ion's purpose is less that of making mini-gaming-machines possible but rather more to speed up the increasingly tenacious emergence of HD contents also on devices with an average CPU performance. A prime example for this would be Youtube. 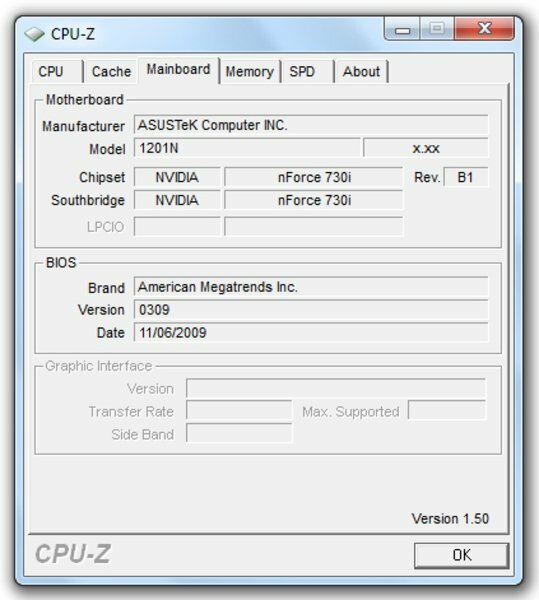 A dual-core CPU starting at about 2.2 GHz would be required for achieving a smooth representation without GPU support. 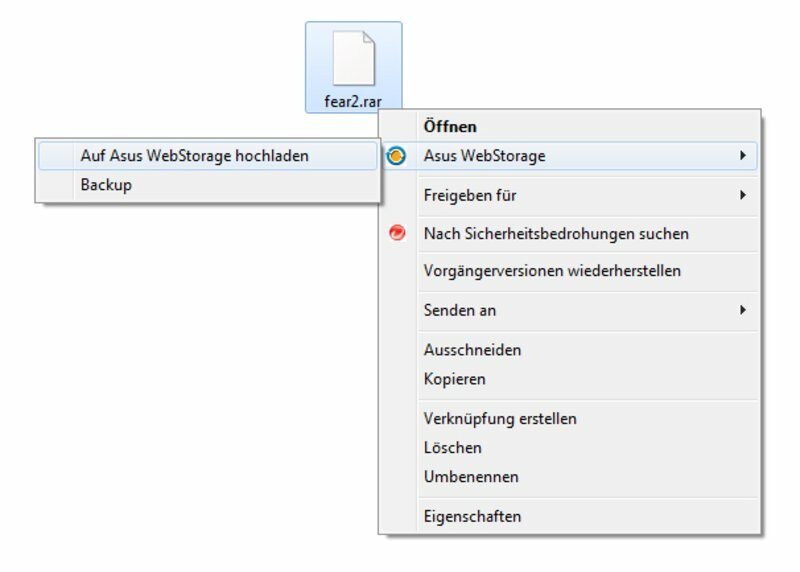 In order to process flash based HD content also with GPU support, the latest version (starting at 10.1 Beta) is definitely required. Under that it's not supported. 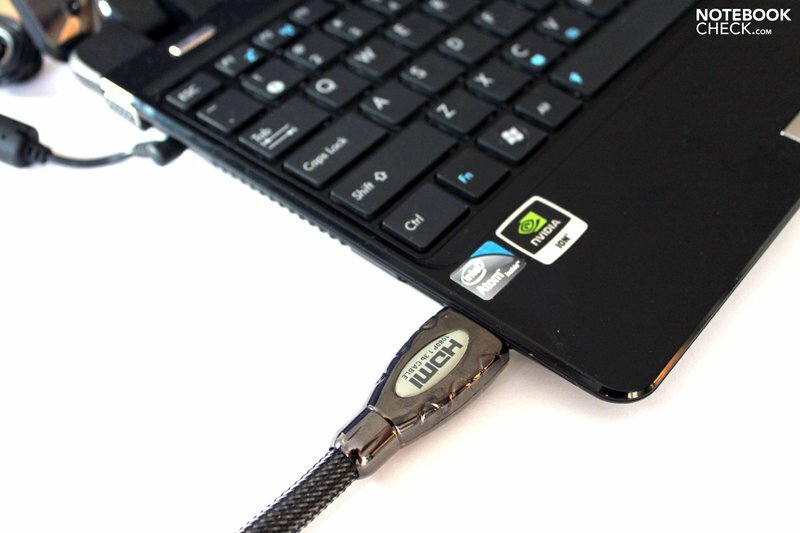 We could also follow the GPU support's impact well on the Asus Eee PC 1201N. A smooth playback of 720p (18-20fps according to Youtube video info, around 70% CPU capacity) was possible with the preinstalled flash version, 10.0.31.18 and the trailer of "Ninja Assassins". The picture jolted very intensely at 1080p (break-ins to 2-3 fps, around 95% CPU capacity). The trailer ran much smoother (15-20 fps) after the upgrade but can't reach the smoothness of 720p (23-26 fps) anyway. The CPU capacity was at around 23% with 720p, over 50% with 1080p. Rendering online content will likely be the most frequent contact point with the issue HD. Details about the topic Ion and video converting, CUDA and rendering performance of various player software can be found in the Samsung N510 review. Asus hasn't only already made a name for itself amongst genuine overclockers. Many notebooks of the Asus' product range already have an integrated overclocking function that can easily be enabled by a push of a button or in software control. An enormous performance gain can be achieved in a few devices (UL range) and then again this gain stays within limits in others. 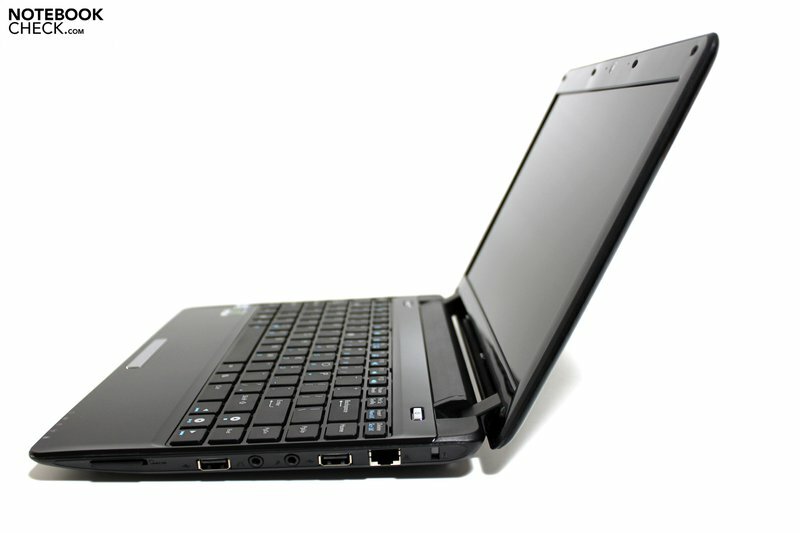 The Eee PC 1201N counts to the second group. 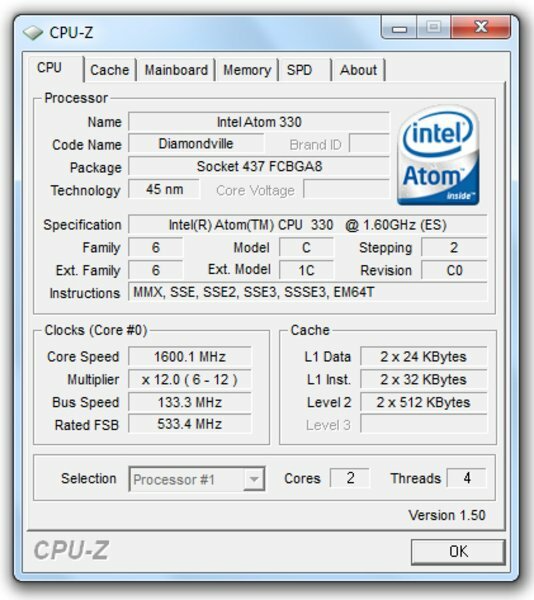 The Intel Atom 330 CPU supplies 1600 MHz ex factory. 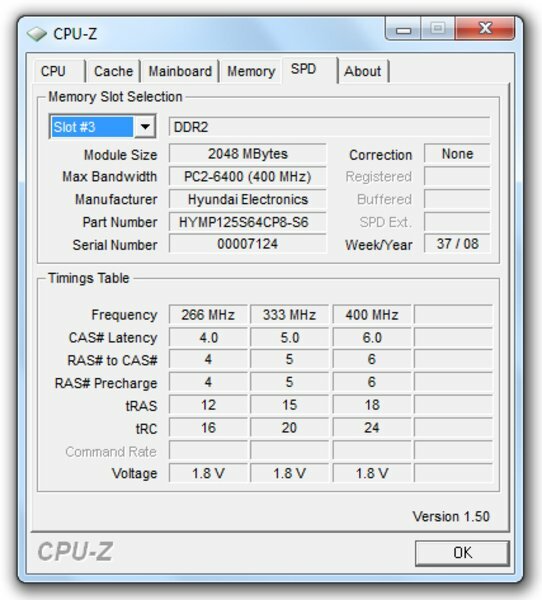 When "Super Performance Mode" is enabled in the Super Hybrid Software, the CPUZ presents a proud 1632 MHz. This is a plus of 2%. 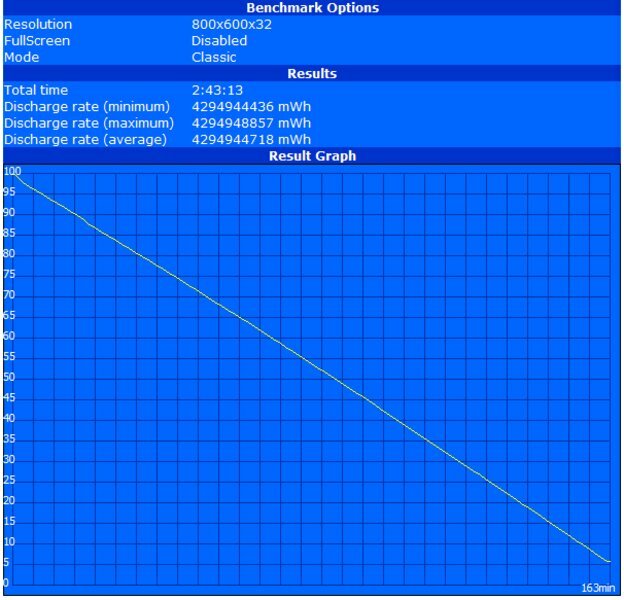 In comparison to the results in the SuperPi benchmark, an advantage of 0.6% or 30 seconds can be recorded at computing to 32 million decimal places. 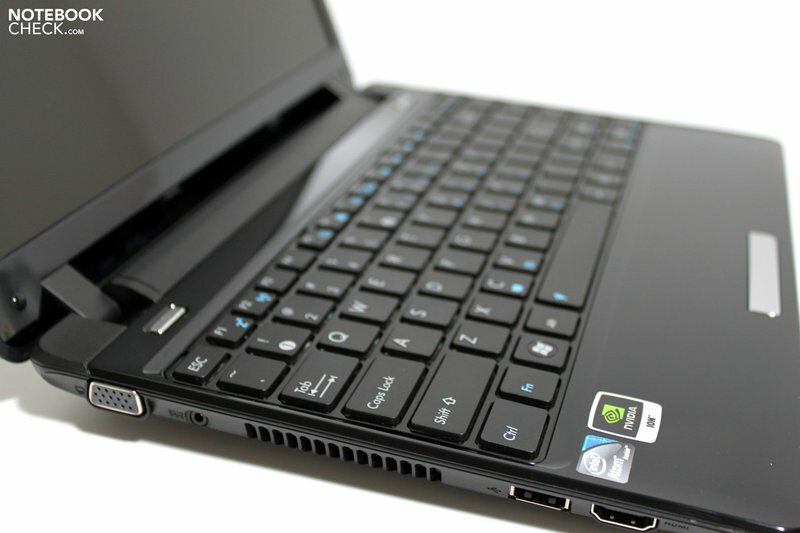 Of course, the question about gaming suitability turns up with a graphic card of type Nvidia Geforce 9400M G. We'll only make single tests following the comprehensive review of Samsung's N510 netbook, equally based on the Ion range. There are a few differences in detail in comparison to Samsung (Ion LE - Ion, N270 - 330, 1GB DDR2-2GB DDR2), but the performance in terms of games barely varies. 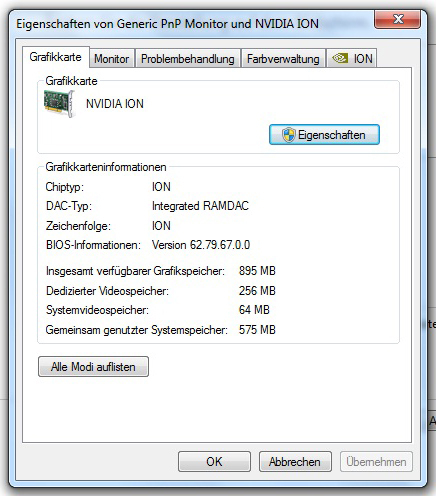 For example, the demo version of Anno 1404 was tested, which can only be called playable with gripes in view of an average of 19.1 fps on Asus' 1201N in the lowest settings. The Samsung achieved 17 fps. More demanding shooters, like F.E.A.R. 2, don't come into question for the netbook. The result is once again only a bit over that of the Samsung (19 fps) with an average of 20.7 fps at insinuating the demo's first mission (800x600, low, bilinear AF, AA off). We also gave Call of Duty 4 a try, which equally ran with only 33 fps on average and jolted visibly in low settings (800x600, low, 0xAA). We admit, the games above already let even strong multimedia notebooks with according settings stagger; less demanding games are more appropriate for the netbook category as to suitability. World of Warcraft would be named here as an example. It hasn't been tested on the Asus, but a well playable 54 fps were achieved on Samsung's N510 with low graphic settings (800x600, low, 0xAA/AF), though. The result should be within a similar field in the Asus. Sims 3, which also has a large fan community, is also found within the bounds of possibility. You won't exceed minimum graphic settings here either, but you can count with a sufficient refresh rate to get the better of the game (800x600, low/off). 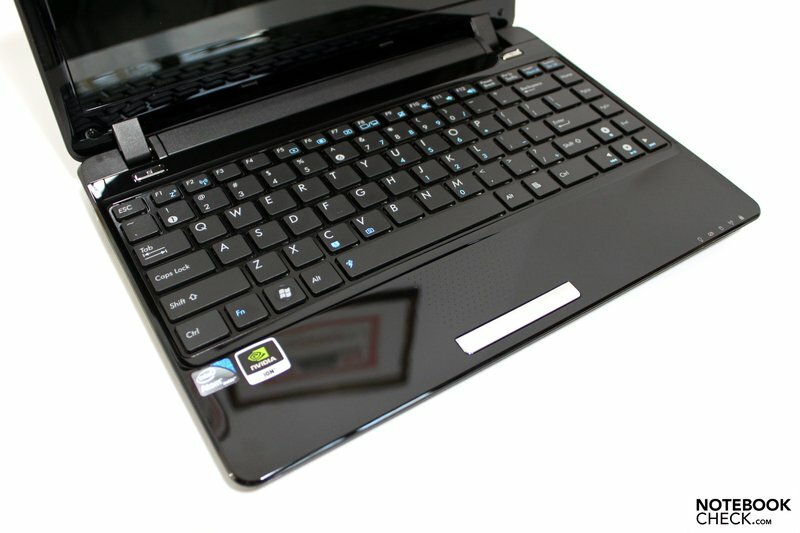 The theory that a notebook's volume is directly connected to the provided performance reserves is also verified by the Asus 1201N. 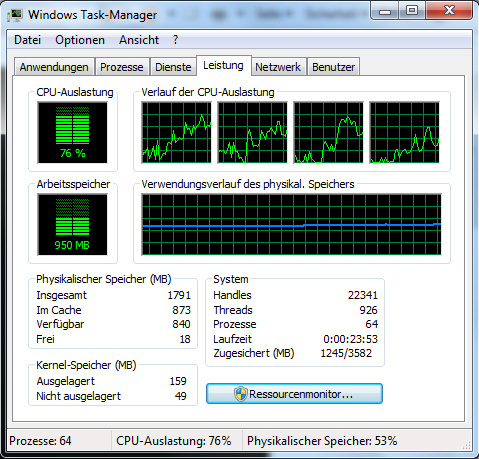 We observed a constant but consistent running of the system fan in idle mode even under low office load. Our noise level measuring device established 34.8 dB(A). Subjectively, the fan can be described as always present even if it stays more in the background and doesn't get unpleasant. 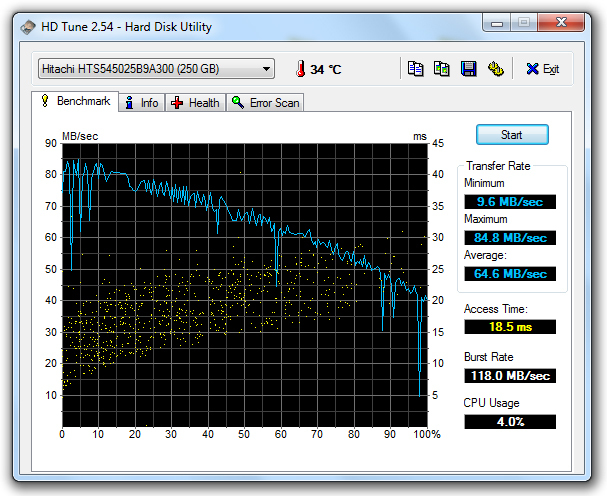 The fan increases its speed a bit under load, for instance at HD video material rendering, and reaches 36.7 dB(A). 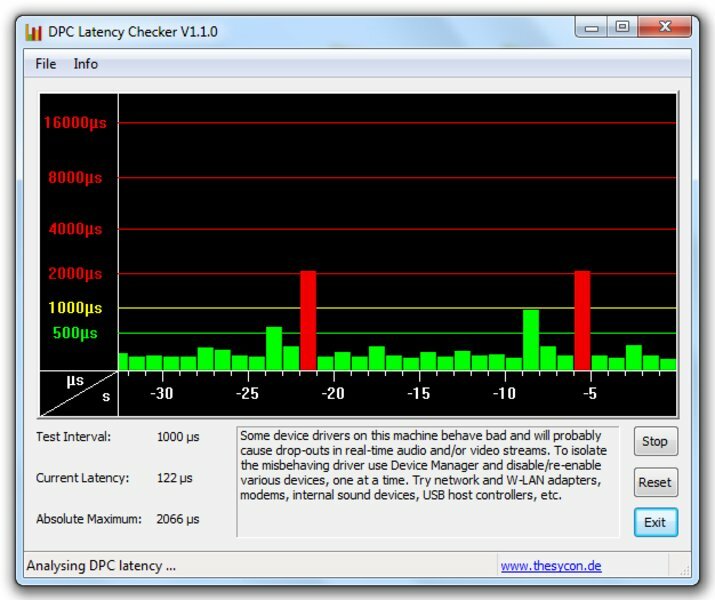 The netbook first reaches a very audible level of 39.1 to 42.1 dB(A) when the CPU and GPU are rigorously put under load. This condition should barely ever, if at all be reached in practical use, though. The heating up of the chassis stays within limits in every operating mode. The base unit's upper side stays in a agreeably tempered field of 26-32°C without load or simple office tasks. The bottom heats up a bit more, particularly in the core component's area, but is also within an uncritical field with 26-35°C. The temperatures only vary slightly under load. The upper side warms up by a maximum of one degree more and the all clear signal can be given to the bottom with a maximum of 38°C. (+) The average temperature for the upper side under maximal load is 29.5 °C / 85 F, compared to the average of 29.8 °C / 86 F for the devices in the class Netbook. (+) The maximum temperature on the upper side is 33.4 °C / 92 F, compared to the average of 33 °C / 91 F, ranging from 21.6 to 53.2 °C for the class Netbook. 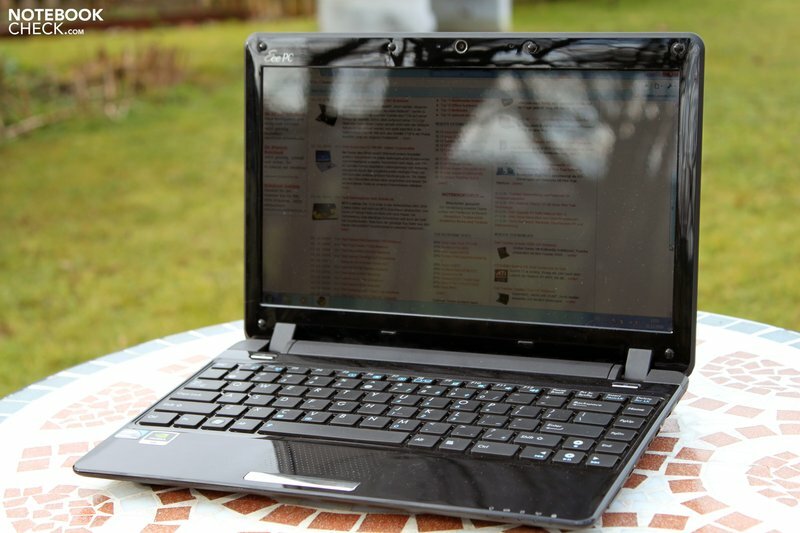 (+) In idle usage, the average temperature for the upper side is 29.2 °C / 85 F, compared to the device average of 29.8 °C / 86 F.
The Asus Eee PC 1201N has two speakers that are positioned underneath the front edge and emit their sound waves downwards. The maximum given volume is satisfactory, but the sound isn't. The lack of any basses are especially obvious in the upper third of the volume. The soundscape is okay for simple music or movie rendering with a quiet volume, but if you value a good sound you should definitely turn to external audio rendering devices. 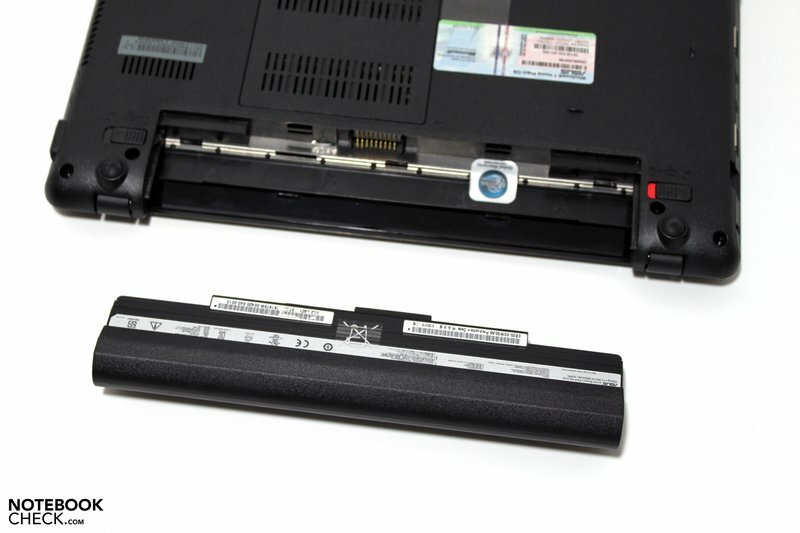 One strength of the Eee PC range has always been its long battery life. This had been secured by an accordingly strong battery, among other things. An accordingly strong power source is also used in the Eee 1201N with a 63 Wh lithium ion battery pack (11.25V, 5600 mAh). 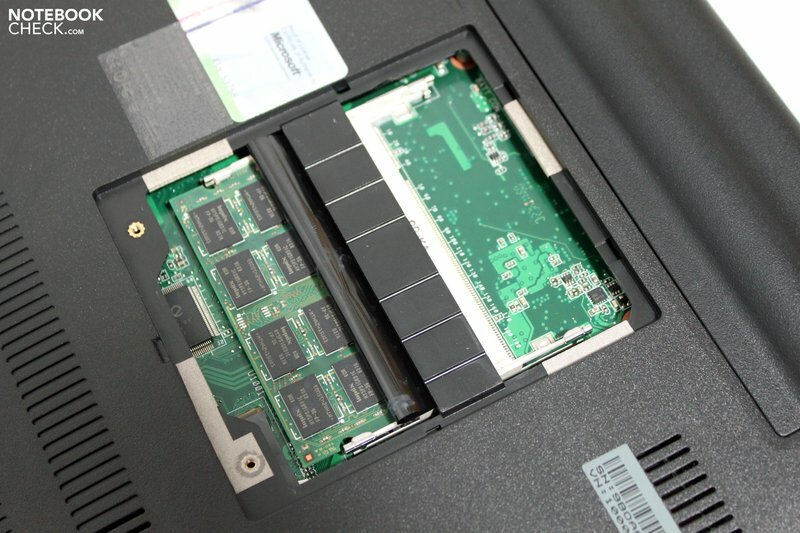 The employed CPU as well as the 9400MG graphic solution don't necessarily count to the most energy sparing components available on the netbook market with a TDP of 8W. Anyhow, the 1201N reaches a maximum battery runtime (BatteryEater Reader's test) of 299 minutes, so short of 6 hours, in favorable conditions due to the voluminous battery. In the worst case scenario, thus under load, maximum display brightness and enabled communication modules, BatteryEater Classic test recorded 163 minutes, around 2.5 hours. The practical WLAN surf test with maximum display brightness and enabled energy savings mode, the 1201N reaches a good 255 minutes in calling up the most different websites. The runtime sinks to about 190 minutes if you focus on rendering HD video material, which is still a feasible rate. If you look closer at the 1201N's assessed power consumption you can make conclusions about the efficient components built into it. 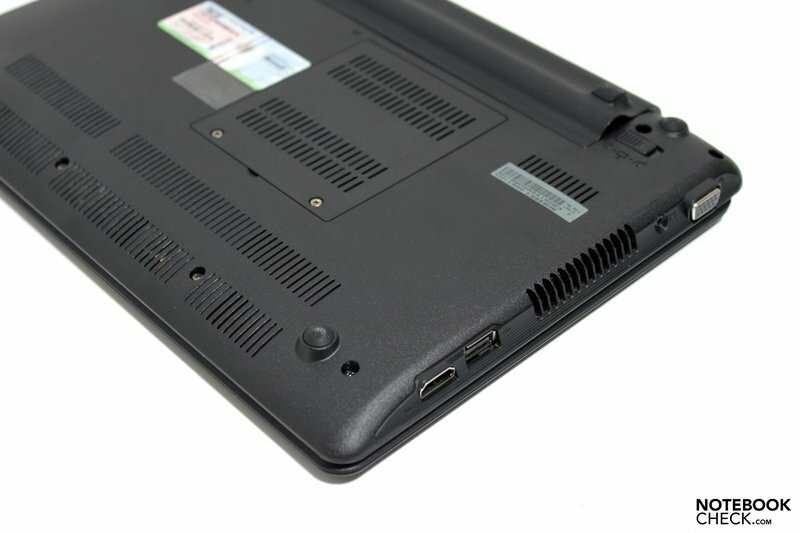 The netbook treats itself to a minimum of 12.1 W, which is considerably over the level of various ULV devices or "common" netbooks. You should also heed the preset Asus screensaver. This drives the power consumption without the user doing anything up to 18.8W. "Fortunately" its soundscape gets annoying so that most users will disable it right away, anyhow. We could drive the power consumption up to a maximum of 28.9W under rigorous load of the core components (CPU and GPU). 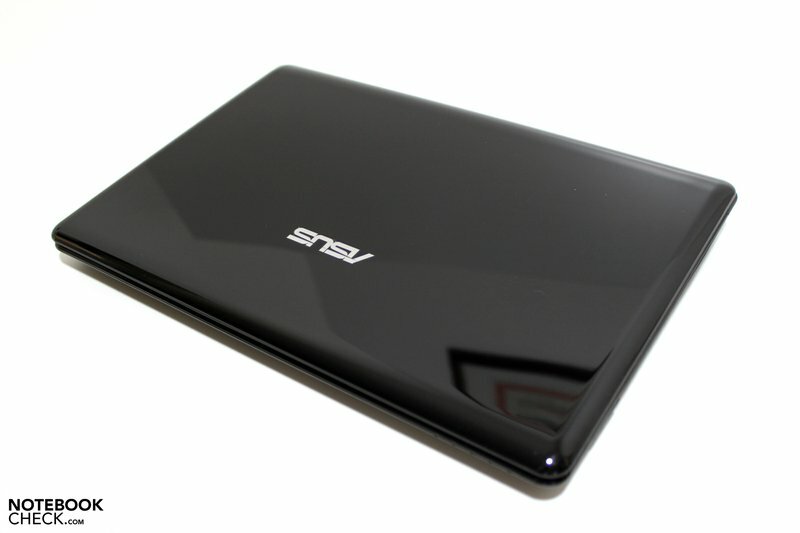 The Asus Eee PC 1201N's most perceptible advantage for the user will likely be its gain in size. On the one hand, this has an effect on the input devices that now almost have the size of fully functional office devices, as well as on the display that provides for a reasonable work environment with a screen size of more than 30 centimeters. However, we have to criticize especially the display in view of the reflective surface and the display's only low basic brightness of a bit over 100 cd/m2. Only well chosen shadowy places at best come in question for outdoor use. The case in the typical seashell design presents itself as very compact and shows a good stability. A good workmanship can be ascribed to the Eee 1201N with exception of the keyboard unit. Unfortunately, the keyboard in our prototype potentially deflected evidently in the left and right halves' center under pressure and even made a clattering noise at typing. The HDMI port makes a connecting to large format external monitors with a high-quality image transmission possible. Unfortunately, the interface has been placed in the very front left area, which could get annoying especially for lefties. 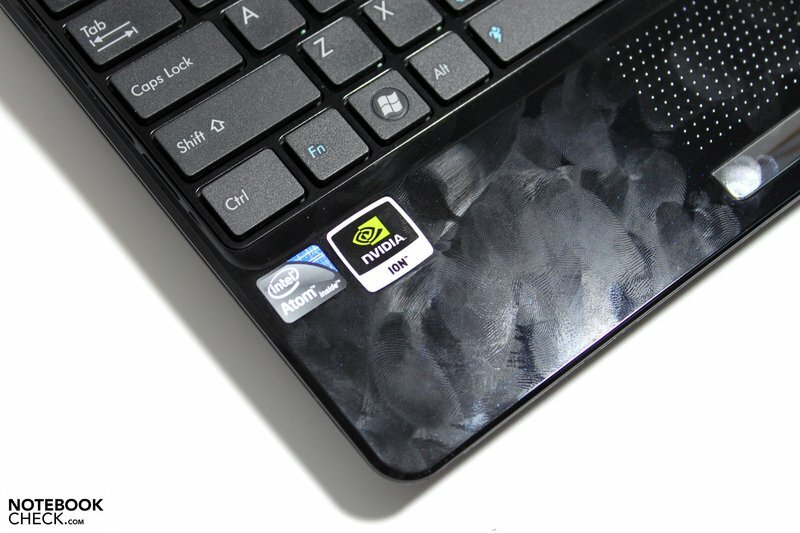 The combination of a dual-core Atom CPU and Geforce 9400M G graphic card again provides the Asus Eee 1201N netbook with a unique selling point on the market. 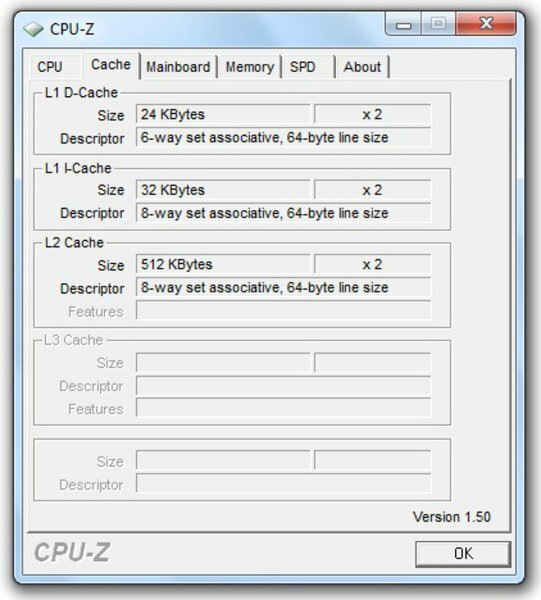 Even if the two core architecture supplies advantages when working simultaneously with several programs, the subjective performance gain is kept within limits. This also applies to the Ion solution, which leave netbooks with a typical configuration far behind, but are back in line in comparison to multimedia configurations of larger notebooks. If the right software is used, the combination can provide a significant improvement with HD content. It's a bit too bad that the netbook is always present even without load. Comparable devices do a better job with that. The battery life of up to six hours turns out satisfactory and grants the Eee 1201N a feasible mobility. The 1201N is just as an interesting option as other Ion platforms for video fans among "heavy surfers". Which device is going to make the race in the end will be decided by further configuration features, such as case, input devices and display. A look at (upcoming) ULV and other compact devices should definitely be taken if the price of around 499 euro is kept upright. The size. 12 inches bids a significant additional value in view of display and input devices and the netbook remains to be very mobile, anyway. A version with an integrated UMTS, at least until the official statement of specifications and model alternatives. Actually a must in mobile devices: a matt and luminous display for outdoor use. The 1201N wasn't able to supply a satisfactorily smooth representation at rendering 1080p flash videos, despite an Ion and a dual-core CPU. The felt performance could also barely benefit from the configuration. In a tighter sense, Ion models of other brands: Samsung N510, HP Mini 311 followed by 13" ULV Notebooks: Asus UL30, Toshiba T130, HP Pavilion dm3, Dell Vostro V13, Samsung X120, ... still in the race: classic netbooks of all manufacturers.